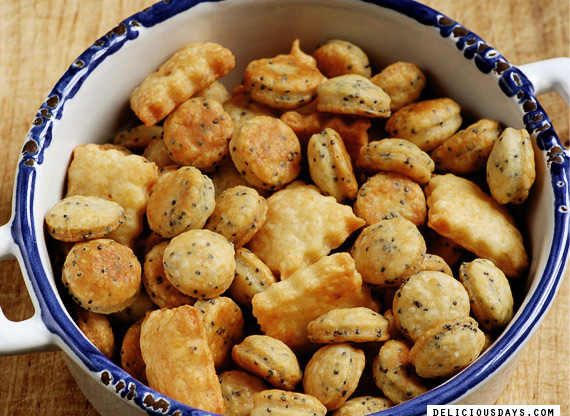 The Mighty Cheese Cracker - Poppy Seed or Chipotle Chile? One very compelling reason I loved visiting my friend Simone were the nibbles her mum always had on display in their living-room. No, I’m not referring to homemade treats or freshly baked cookies, I’m talking about those huge boxes called “Party Mix”, which contained assorted pretzels and cheese crackers, that were so hip during the 80s. I’m pretty darn sure it wasn’t the quality of those nibbles that draw me in, more likely the fact that we rarely had something similar at home. 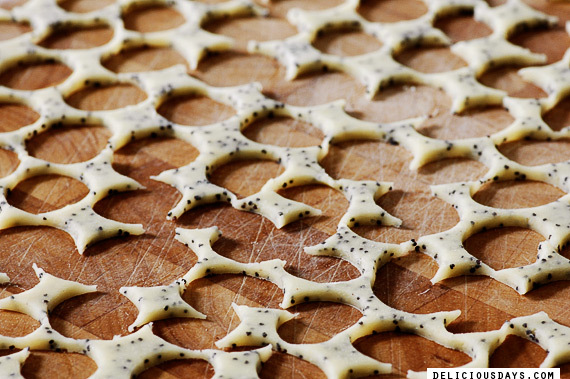 My favorites always were those tiny, poppy seed-speckled crackers. Today, more than 20 years later, I still have a weak spot for tiny crackers, but much prefer the homemade alternative. If you’re a first-timer and have never made crackers at home, this is an easy, no-fuss recipe to start with. I have tried different cheeses (like Asiago or Mimolette), but prefer a mild Cheddar for this recipe. And though my favorite flavor combination is to pair it with poppy seeds, a close runner-up is a slightly hot cracker with a smoky note, which is spiced with ground chipotle chiles. Feel free to try different spice or herb additions to build your very own “Party Mix”! This recipe is one of many that didn’t make it into my new book. Not because it isn’t worthy, make no mistake, but we already had settled on another cracker recipe for chapter three. In hindsight, nibbling on these right now makes me regret that decision, we should have squeezed it in – somewhere, somehow! 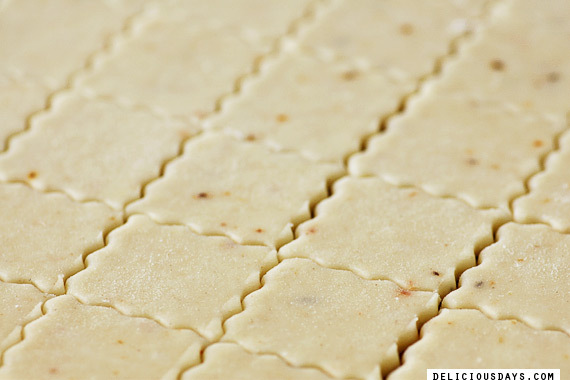 These crackers can be made by hand (preferably with a pastry cutter) or with a food processor – I prefer the latter. Grate the cheese. Add flour, salt and ground chipotle OR poppy seeds into the bowl of your food processor and pulse a couple of times. Cut the cold butter into small cubes and add them to the dry ingredients using the pulse function four or five times until you can spot no butter pieces that are larger than small peas. Add the grated cheese and pulse again until well incorporated. Lastly add 2 to 3 tablespoons of water and pulse again. The dough will start to come together in large lumps. Dump onto the worktop and quickly knead together into a ball, then form into a disc and wrap into foil or cling film. Chill for 30 to 60 minutes. Preheat the oven to 180°C (355°F). Line a baking sheet with parchment paper. Slightly flour the worktop and the dough, then roll out the dough with a rolling pin, about the same thickness as cut-out cookies. Cut out shapes in small, nibbling size using cookie cutters or use a pie cutter to cut the cracker dough into small rectangles and transfer to the baking sheet. Bake on middle level for 11 to 14 minutes or until the crackers have gained a nice golden brown color (don’t let them get too brown or they will develop an unpleasant burnt taste). Take crackers out of the oven and let slide onto a wire rack to cool off completely. Store in an airtight container for a couple of days, yet they are best eaten on the day baked. I recently made homemade crackers for the first time and could not believe how easy it was! They were so tasty and full of only wholesome goodness - none of the extra stuff you'll find in processed crackers which I love! The poppyseed version sounds right up my alley. I can't wait to bake up another batch... Thanks for sharing your recipe! I'm new to blogging, and my passion is food. Youre recipes are really fantastic, and you take beautiful well thought out photos. Glad I found it! These are so cute and yummy looking too! It seems that you could come up with so many variations of these........I'm thinking a little finely chopped rosemary with a hint of sun dried tomato would be delicious, thanks! Ooooh! I remember those 80's cardboard things, but these look fantastic! This recipe is a keeper for sure! How fun and simple are these. My wife will really enjoy these and it will be something we can do together. Thank you for sharing these. wow....these look INCREDIBLE! i just returned from a ski trip where we had a few tubes of 'Utz' snack mix laying around (which is basically chex mix on steroids - only the good parts and none of the boring ones!). we all sat around munching on it at night while drinking beer, and all i could think about was how awesome it would be to have a homemade version. i think you read my mind! I love making my own crackers and these look wonderful, thanks for the recipe. These look delicious! I've made a few different crackers that have all been great, but none with bread flour. May I ask, why did you choose it for this recipe? Homemade crackers are guaranteed to make anyone feel special. I love how yours are so chubby and adorable. They are just begging to be pinched! These look delectable. Now for the 1000 euro question - where to get ground chipotle chiles in Germany? Viktualienmarkt? Lora, If you can't find it in shops, you can always order it here. I also prefer those with poppy seeds! Nicky, your crackers look so PERFECT! Amazing...I think I definitely have to try this recipe! Oh I'd love to make these for my 2-year-old nephew :) He loves all things salty, especially crackers! 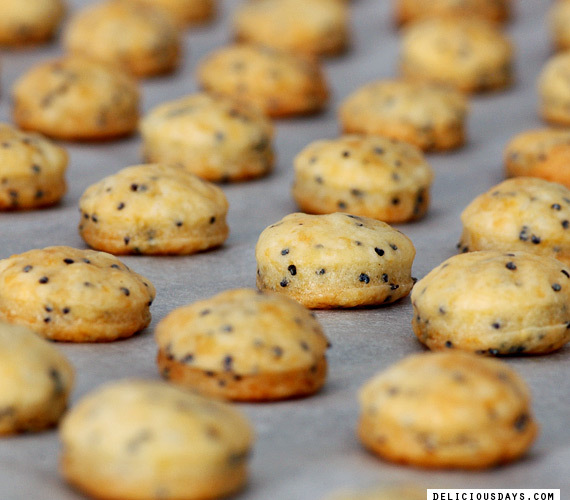 The poppy seed ones looked so cute! New post, hurrah! Love these ones, great idea (hehe do know "Party mix", husband loves those but surely your version is so so much better and healthier, def will do!)! smokey turkish red pepper for me - but let me say, that one "inside" pic shows a great texture, definitely want that, no matter what taste! Home baked party mix.... great idea! I'm going to bake up a batch of these for the gang this weekend. Thanks for great crackers I will cook for my grandson. Thank you so much for sharing the recipe. I have to be honest here, instead of loving those store bought crackers, I was always disappointed when someone put them on the party table.. As a young kid I was already into weird French cheeses and bites other kids didn't like. These crackers on the other hand look really tasty, so I might have to try them and maybe change my opinion about crackers for good.. But we all know home-made stuff is almost incomparable to the machine stuff.. These look so yummy and simple! I really want to make crackers and have been keeping my eyes peeled around the interweb for good recipes... this might have to be the one! Thanks! This look great - easy & delicious. But I have to say "Mighty" only has one "h". Thank you Penelope, fixed it in the ingredients section! I've always wanted to make homemade crackers at home, but never really found a recipe that intrigued me as much as this one! Definitely going to have to try it out this weekend! Whoever got to eat the amazing nibbles is a lucky person! Just looking at your pictures make me feel lucky already! I love this cracker recipe!! Could you please tell me the conversion from grams to ounces for the mighty cheese cracker? Great little snacks. Surely great with a glass of wine. Thanks for this yummy recipe; I can't wait to make these crackers! I especially love the scalloped edge effect—a lovely look and no waste. 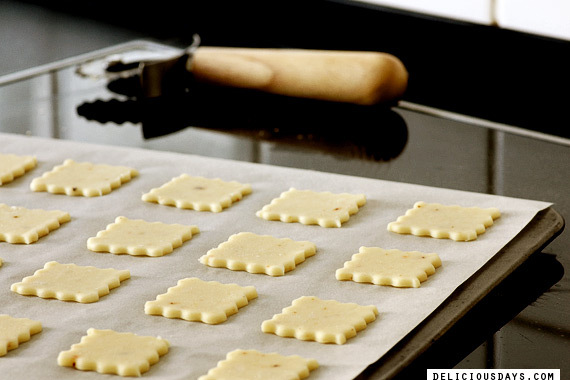 I make savory shortbread crackers, but these look lighter and crisper. Just stumbled upon your Blog! Simply great! Glad that I found it! I would take one (or ten) with nigella seeds! yummy! i have to do it this week! thank you! Finally I have a perfect reason to post my comment here and express my admiration for your website and photos! 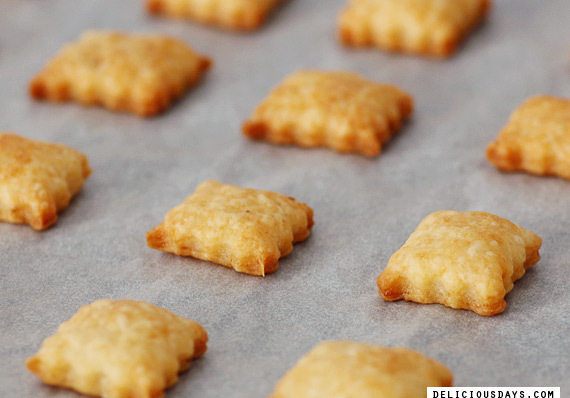 In fact today I have prepared your cheese crackers, the first recipe I tried from your website. I have used gruyère and Korean chili and, since it's almost Easter, I cut them out with my bunnie cutter. They are really simple, very good, hot (I have put 2 tablespoons chili) and look so cute! Thank you for this recipe. Next time I'll try the poppy seeds version. I love homemade crackers. There is no end to the flavor combinations possible! Bacon and cheddar, blue cheese and hot sauce, Havarti and caraway seeds. YUM! Having a massive craving for some right now! Love them! Your photos are gorgeous. 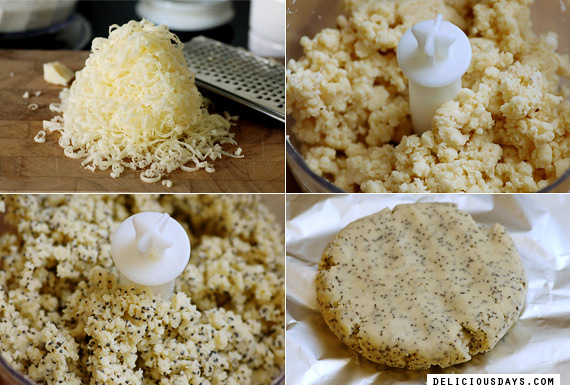 I love the idea of poppy seeds in cheese crackers. 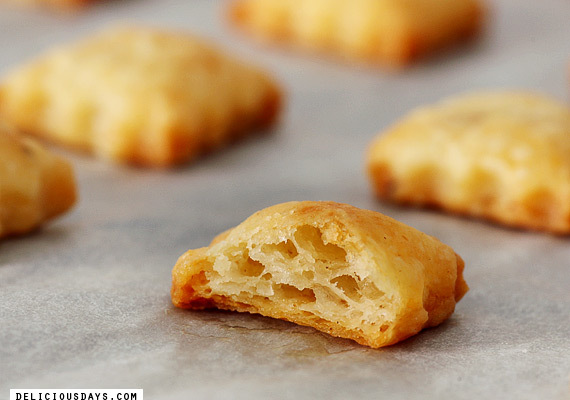 I will need to pick up a mini cookie cutter online so I can try these out! I think I saw a goldfish-shaped mini cookie cutter somewhere, which I think would be adorable! I was looking for something salty to bake this evening. This is it! Thanks. This is to die for. So cute. I'm linking your blog on my blog because everything on it just looks too good! Just discovered your website..love, love it. Made these today. Super delicious, my kids love them. I used black sesame seeds (couldn't locate my poppy). And I added a couple tbls of flax meal. Thanks for your inspiration.